Shortly before seven last Saturday, Doctor Who and exotic new assistant Leela, having somehow succeeded in escaping from a battery of death-dealing laser rays directed at them from within the head of a dragon by a mutinous Chinese homunculus, climbed once more into their battered Tardis and departed in the general direction of next September. All those children (and adults) who have been following their exploits, often from behind chairs or through cracks between their fingers, over the years, will be counting the weeks through summer until, their return, only marginally consoled by the appearance in the Doctor Who slot this week of that equally unlikely and terrifying figure Mr Rolf Harris. During an in-house celebration of 13 years of Doctor' Who on BBC Television last weekend, Mr Melvyn Bragg fairly asserted. 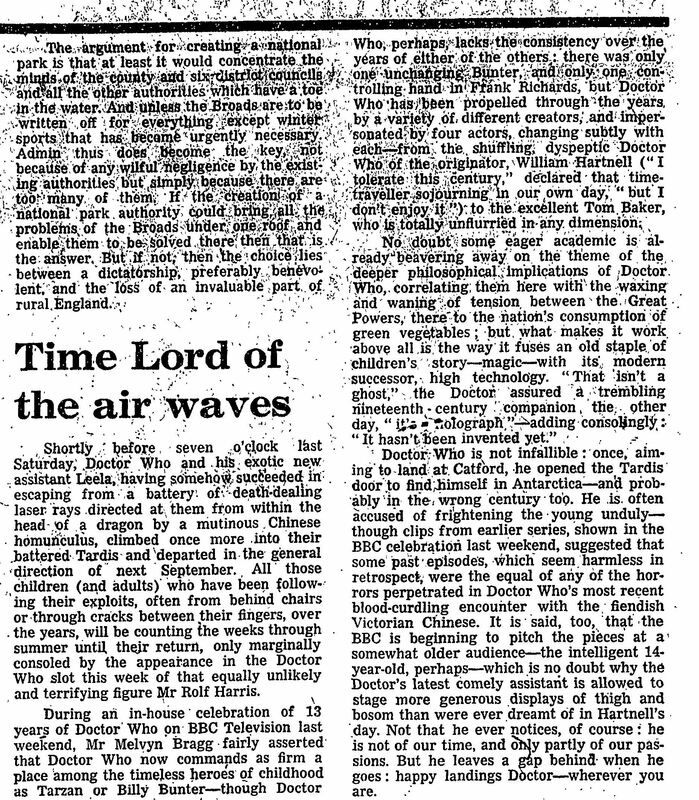 that Doctor Who now commands as firm a place among the timeless heroes of childhood as Tarzan or Billy Bunter—though Doctor Who, perhaps lacks the consistency over the years of the others: there was only one unchanging Bunter, and only one controlling hand in Frank Richards, but Doctor Who has been propelled through the years, by a variety of different creators, and impersonated by four actors, changing subtly with each--from the shuffling, dyspeptic Doctor Who of the originator, William Hartnell ("I tolerate this century," declared the time-traveller sojourning in our own day, "but I don't enjoy it) to the excellent Tom Baker, who is totally unflurried in any dimension. No doubt some eager academic is already weaving away on the theme of deeper philosophical implications of Doctor, correlating them here with waxing and waning of tension, between the Great Powers, there to the nation's consumption Of green vegetables ; but what makes it work above all is the way it fuses an old staple of children's story—-magic--with its modern successor, high technology. "That isn't a ghost," the Doctor assured a trembling nineteenth century companion the other day, "it's a holograph" adding consolingly: "It hasn't been invented yet." Doctor Who is not infallible: once aiming to land at Cattord, he opened the Tardis door to find himself in Antarctica—and probably in the wrong century too. He is often accused of frightening the young unduly—- though clips from earlier series, shown in the BBC celebration last weekend, suggested that some past episodes, which seem harmless in retrospect; were the equal of any of the horrors perpetrated in Doctor Who's most recent blood-curdling encounter with the fiendish Victorian Chinese. It is said, too, that the BBC is beginning to pitch the pieces at a somewhat older audience—the intelligent 14-year-old, perhaps—which is no doubt why the Doctor's latest comely assistant is allowed to stage more generous displays of thigh and bosom than were ever dreamt of in Hartnell's day. Not that he ever notices, of course he is not of our time, and only partly of our passions. But he leaves a gap behind when he goes: happy landings Doctor—wherever you are. APA 6th ed. : (1977-04-09). Time Lord of the air waves. The Guardian p. 8. MLA 7th ed. : "Time Lord of the air waves." The Guardian [add city] 1977-04-09, 8. Print. Turabian: "Time Lord of the air waves." The Guardian, 1977-04-09, section, 8 edition. This page was last modified on 21 December 2014, at 18:51.